Researchers in the Sinai App Lab at the Icahn School of Medicine at Mount Sinai have developed RxUniverse, the first enterprise-wide digital medicine care delivery system that enables physicians to digitally prescribe evidence-based mobile health applications to patients at the point of care. 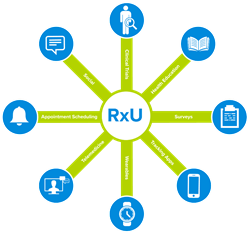 RxUniverse is the first enterprise-wide digital medicine care delivery system that enables physicians to digitally prescribe evidence-based mobile health applications to patients at the point of care. RxUniverse allows physicians and other healthcare providers to seamlessly and confidently integrate evidence-based digital health tools into their practice. With countless mobile health apps available to consumers, there is no standardized method for providers to know which ones will clinically benefit their patients, and no way for them to share them with patients directly. Through RxUniverse—which features a curated list of apps that have been evaluated for efficacy based on published evidence and incorporated into a digital prescription delivery system—Mount Sinai Health System aims to be the first provider network in the country to address this problem. The RxUniverse platform was launched in August 2016 in a pilot phase throughout five clinical areas at Mount Sinai. Since then, participating physicians have prescribed more than 2,000 apps, exceeding 20 times the pilot goal. In response to this success, the Sinai AppLab has partnered with Mount Sinai Innovation Partners to launch a new startup company, Responsive Health, which will license RxUniverse for use by other health systems. RxUniverse is part of a larger ecosystem called the Network of Digital Evidence (NODE Health), which provides a community forum and structure for health system technology experts, digital medicine tech companies, clinicians and patients, to come together around digital medicine and the state of scientific evidence surrounding its design, efficacy, and implementation. “RxUniverse will empower health care providers to bring multiple digital health tools directly to the hands of our patients quickly and reliably,” said Bruce Darrow, MD, PhD, Chief Medical Information Officer of the Mount Sinai Health System. The applications for RxUniverse do not stop at mobile health apps. Specifically tailored educational content, patient satisfaction surveys, and other tools can be digitally prescribed to individual patients, or entire populations of people.